We try to anticipate questions you might have about our PRODUCT / SERVICE and provide the answers here. If you need additional information send email to info@beastriders.com. Q. What sizes and models do Beast Riders come in? And what are the prices? Q. What size dog can ride in a Beast Rider? A. Up to 75 lbs. or 34.09 kg. Q. Do I need a sissy bar or passenger backrest? A. The large Beast Rider requires a tall sissy bar which measures at least 10" or 25.4cm from the top of the passenger seat to the top of the sissy bar; the medium Beast Rider requires a medium size sissy bar; the small requires a small size sissy bar. Sometimes the small Beast Rider can be attached without a sissy bar. Q. How does a small, medium, or large Beast Rider attach to my bike? A. The back of the Beast Rider is attached to the sissy bar via adjustable leather buckle straps. There are nylon webbed scissor snap straps that come down from the base of the front of the Beast Rider that attach to bungee nuts on the sides of the fenders. Or, if you have grab rails, there is a nylon webbed loop strap that threads thru and around the rails and seat and is cinched down. Q. How does a Dresser or Ultra Dresser Beast Rider attach to my bike? A. There are two sets of slots placed in the base of your Beast Rider. One set to the back and one set to the front. There are two nylon web loop straps that are threaded through the slots in the base of the Beast Rider and around grab rails or under the passenger seat and cinched down. Q. Does the harness come with a Beast Rider? A. Yes, it is included with the Beast Rider. Q. How is my dog held in place in a Beast Rider? A. Your dog wears the Beast Rider K-9 harness with Dee rings. There are three adjustable leather scissor snap straps that are attached to the Beast Rider. They snap on to the Dee rings on the harness. All the straps are adjustable. This is the restraint system for your dog. A. Shearling is actual sheepskin wool. It is not a synthetic fleece. We offer the following colors of 1" shearling: Black, gold, natural and grey. Also, we offer the following colors for 2" shearling: Black, white with brown tip, white with black tip, brown with black tip, and grey with black tip. Q. How do I measure my dog for the Knoggles? A. 1. Measure from the outside corner of the left eye around the back of the head, under the ears, to the outside corner of the right eye; 2. Measure from the outside corner of the left eye under the muzzle to the outside corner of the right eye; 3. Measure between the eyes from the inside corner of the left eye to the inside corner of the right eye. Q. What is the Beast Rider Back Support? A. The back support is a detachable accessory that can be buckled onto the front of the Beast Rider if desired. 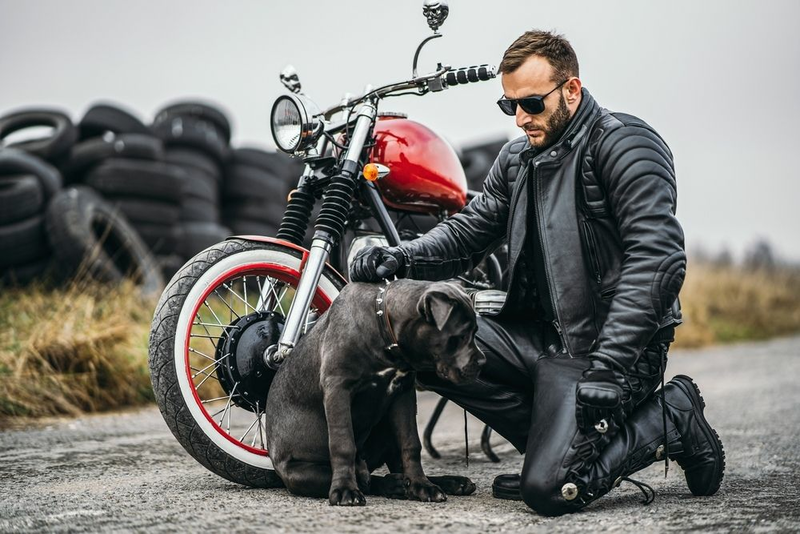 It is for those bikers who don't have a back support for their bike and would like to have the extra support while riding with their dog. It is best to order this accessory when ordering your Beast Rider. Q. How long does it take to receive the Beast Rider? A. It usually takes 18 weeks for delivery. Placing your order starts the process for handcrafting your Beast Rider. Q. How much time do I have to return my Beast Rider and receive a refund? A. You have thirty (30) days from the day your Beast Rider is received to return it for a refund. Q. How is my Beast Rider mailed or shipped? A. The options for delivery are USPS priority mail insured, UPS Ground, Federal Express Home, or USPS priority mail insured international. Q. How long does it take to receive my Beast Rider when sent USPS priority mail insured international? A. It takes 6-10 days to arrive to the destination country, then there is some time in customs which varies. Q. What amount or percentage are the customs fees? A. Customs fees vary from country to country. You can inquire for what percentage your particular country charges either on the internet or a commerce department in your country.